I don’t bake blondies very often, but so far the recipes I’ve made turned out delicious – Martha’s gingerbread blondies I made back in 2010 were just irresistible. When I saw Dan Lepard’s banana blondies I had to make them: not only because a blondie made of banana made me curious but also because I’d be able to use up some of my banana overload; oh, and before I forget to mention, there’s chopped praliné mixed in the batter. Praliné. In the batter. With banana and white chocolate. Make the pecan praliné: lightly oil a small baking sheet. Put the sugar and water in a small heavy saucepan. Over medium heat, bring to the boil and let it bubble away, without stirring, until the sugar turns to golden caramel. Stir in the pecans and immediately spread onto prepared sheet. Cool completely, then finely chop. Blondies: preheat the oven to 180°C/350°F. Line the base and sides of a 20cm (8in) square pan with foil, leaving an overhang in two opposite sides; butter the foil. Combine the butter and white chocolate in a heatproof bowl and place over a saucepan of barely simmering water, stirring until melted and smooth. Remove from the heat and mix in the sugar. Beat in the egg and vanilla. Stir in the bananas. Sift the flour, baking powder and salt over mixture, then fold through with the chopped praliné. Spoon into the prepared pan and bake for 35 minutes or until wobbly-set and golden on top. Cool completely in the pan over a wire rack. Cut into squares. 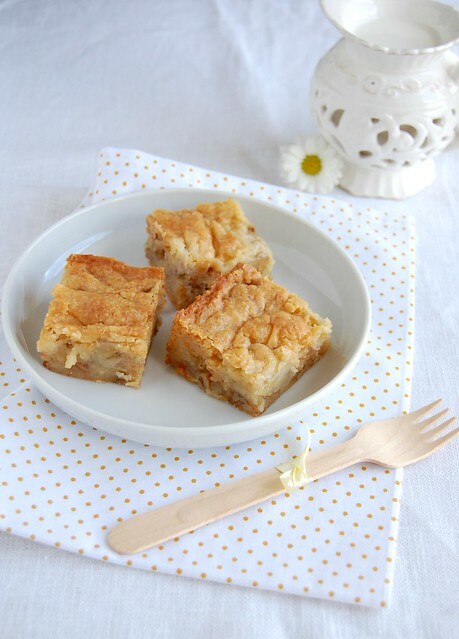 Patricia, when I read "Banana Blondies", I thought, "no thank you" (I'm not a fan of baked bananas), but then I read the whole post: "bananas with praline and White chocolate..." and that was enough to change my mind. Thank you for another yummy idea! Wow! What a great alternative to Banana Bread! I I'll be trying ths recipe soon! I don't need to hear any more, you've won me over!!! Praline in the batter? Sign me up! That does sound amazing :) thanks for sharing. Love the photos too. What a clever and delicious combination! I made these yesterday, but subbed the pecan praline for cashew praline as I had some leftover from a few days ago. They were lovely, if a tad dense. I really enjoyed the chunks of banana throughout - often bananas in baking don't get to be much of a star, here they were delicious. I'm glad to hear you liked the recipe - blondies are more on the dense side, since they're not cakes.